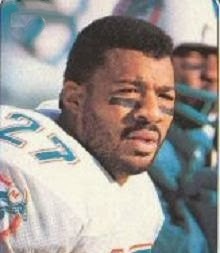 The Miami Dolphins were struggling at 6-7 as they faced the New Orleans Saints on December 7, 1986. Head Coach Don Shula’s team, which had been to the playoffs in each of the five preceding years and had come within a game of repeating as AFC Champion in ’85, still had a prolific offense that was directed by fourth-year QB Dan Marino (pictured at right). However, the defense, despite the addition of star rookie LB John Offerdahl, was playing poorly and had twice given up 50 or more points in a game. New Orleans, under first-year Head Coach Jim Mora, was also at 6-7 after having lost the two preceding games. Rookie RB Rueben Mayes was exceeding expectations and the defense was tough against the run, but QB Dave Wilson, who regained the starting job when newcomer Bobby Hebert (like Coach Mora, a refugee from the USFL) went down with an injury early in the year, was nothing special. There were 64,761 fans in attendance at the Louisiana Superdome. The Dolphins had the ball first and went 80 yards in 12 plays. 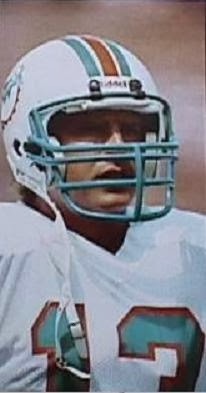 Dan Marino connected on all six of his passes and RB Lorenzo Hampton carried five times for 32 yards, including a four-yard sweep around end for a touchdown. Fuad Reveiz added the extra point. New Orleans responded by also putting together an 80-yard drive, using eight plays. Dave Wilson started off with a 20-yard completion to WR Mike Jones and had two throws to TE John Tice for 26 yards. Rueben Mayes ran for a 20-yard TD and, adding Morten Andersen’s PAT, the score was tied at 7-7. RB Craig Ellis returned the ensuing kickoff 41 yards to give the Dolphins good starting field position, and they made the most of it. Marino threw to Hampton for 13 yards and, after Hampton ran twice to pick up another ten yards, Marino completed three more passes. The last was to TE Dan Johnson for a 13-yard touchdown and, with Reveiz’s successful conversion, the Dolphins led by 14-7 after a quarter of play. The Saints punted to start the second quarter and Miami, surviving a scare when an interception of a Marino pass was nullified by a penalty, again put together a scoring drive, going 61 yards in six plays. Hampton and FB Woody Bennett both had good runs along the way and Marino connected with TE Bruce Hardy for a four-yard touchdown. Reveiz kicked another extra point and the Dolphins were ahead by 21-7. New Orleans went 66 yards on the next series, the big play being a pass from Wilson to Jones for 45 yards to the Miami 19. The drive finally stalled at the 10, but Andersen narrowed the margin with a 27-yard field goal. Marino connected on short passes on Miami’s next possession, although he overthrew a wide-open WR Mark Duper at one point. Reveiz finished the 14-play, 59-yard series with a 43-yard field goal to make the tally 24-10. The Saints looked to be moving toward another score as Wilson threw to Jones once again, this time for a 23-yard gain, but a throw up the middle to WR Herbert Harris that was good for 27 yards to the Miami 17 was for naught when the receiver fumbled and CB Mike Smith recovered for the Dolphins at the two. Pinned back deep, Miami went three-and-out, but got the ball back three plays after punting it away when a Wilson pass was picked off by CB Don McNeal. Starting at the New Orleans 41 with less than a minute remaining in the half, the Dolphins took four plays to score again, this time with Marino throwing to RB Tony Nathan, who went the distance from 23 yards out. Reveiz’s PAT put the visitors in front by 31-10 at the intermission, but while Miami had largely dominated the first half, the momentum would shift in the second half. The Saints took the second half kickoff and went 80 yards in six plays. Mayes (pictured at left) had two runs that totaled 18 yards to start the series and, after being sacked, Wilson tossed passes to Harris for 11 yards and Tice for 24. Mayes ran the last 34 yards for a touchdown and, with Andersen’s conversion, Miami’s lead was narrowed to 31-17. The Dolphins punted following a short possession and New Orleans again drove into Miami territory, helped along by Mayes running for 32 yards on the first play and a first down picked up on a fake punt. However, the Saints came up empty when Andersen’s 50-yard field goal attempt was wide to the left. The Dolphins again had to punt and New Orleans put together a 68-yard series in 12 plays. Mayes had a 22-yard run along the way and Andersen kicked a 29-yard field goal to make it an 11-point game heading into the fourth quarter. 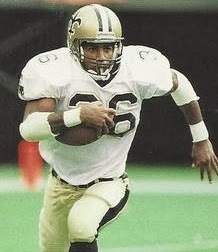 Miami drove to the New Orleans 36, but Hampton was held to no gain by LB Sam Mills on a fourth-and-one carry to give the ball back to the Saints. Wilson connected on passes to Mayes for 14 yards, Tice for 15, and Jones for another 15 yards and Mayes continued to run effectively. The eight-play, 68-yard possession ended with Wilson tossing a three-yard TD pass to Tice in the middle of the end zone and Andersen’s extra point made it a four-point contest with just under seven minutes remaining. The momentum remained on the home team’s side as the Dolphins went three-and-out and had to punt. Starting at their 34, the Saints again drove into Miami territory. Mayes ran on the first three plays for a total of 24 yards and Wilson threw to WR Eric Martin for 20 yards to the Miami 22. After runs by RB Dalton Hilliard and Mayes netted six yards, Wilson converted a third-and-four situation with a 10-yard completion to Jones that got the ball to the six yard line. Mayes ran for five yards and then had an apparent TD that was nullified by a motion penalty. Two running plays lost yardage and, facing fourth-and-goal from the eight, Wilson threw a pass intended for Harris in the end zone that was too low and fell incomplete. That effectively ended the game, in which the Dolphins held on to win by a score of 31-27. The Saints significantly outgained Miami (526 yards to 352), with 257 of that total coming on the ground, and also had the edge in first downs (26 to 25). New Orleans suffered the only two turnovers of the game, as well as the only sack and five of the six penalties. Dan Marino completed 27 of 41 passes for 241 yards and three touchdowns with no interceptions. Lorenzo Hampton (pictured at right) rushed for 88 yards and a TD on 17 carries and caught 7 passes for 64 more yards. Tony Nathan, typically used as a receiver out of the backfield more than a runner from scrimmage at this point in his career, added 6 pass receptions for 57 yards and a score. Mark Clayton contributed the most of any of the wide receivers with four catches for 47 yards. For the Saints, Rueben Mayes had a big day with 203 yards on 28 rushing attempts that included two touchdowns. Dave Wilson was successful on 19 of 34 throws for 276 yards and a TD with one interception. Mike Jones was the top receiver with 6 catches for 119 yards and John Tice added 5 receptions for 68 yards and a TD. The Dolphins had only slender playoff hopes following the win and they were ultimately extinguished as the club finished at 8-8 and in third place in the AFC East. New Orleans ended up with a 7-9 record for fourth place in the NFC West. The sense that the teams were heading in different directions would be confirmed in the next few years – Miami would not return to the postseason until 1990 while the Saints had a franchise-first winning record in ’87 and went to the playoffs. Dan Marino led the NFL in pass attempts (623), completions (378), yards (4746), and TD passes (44) and was a consensus first-team All-Pro selection for the third straight year as well as Pro Bowl choice for the fourth. Lorenzo Hampton had a productive year as he rushed for 830 yards and 9 touchdowns and caught 61 passes for 446 more yards and another three TDs. Rueben Mayes was named to the Pro Bowl and also received consensus Rookie of the Year honors after rushing for 1353 yards on 286 carries (4.7 avg.) despite playing with a damaged Achilles tendon that required surgery after the season.